Outdoor cushions – for your patio set, Adirondack chairs, and benches – never seem to last much more than a single season. Despite your best intentions, they get left outside and fade in the sun or get soaked in the rain and mildew. It seems like every year we have to shop for replacements. 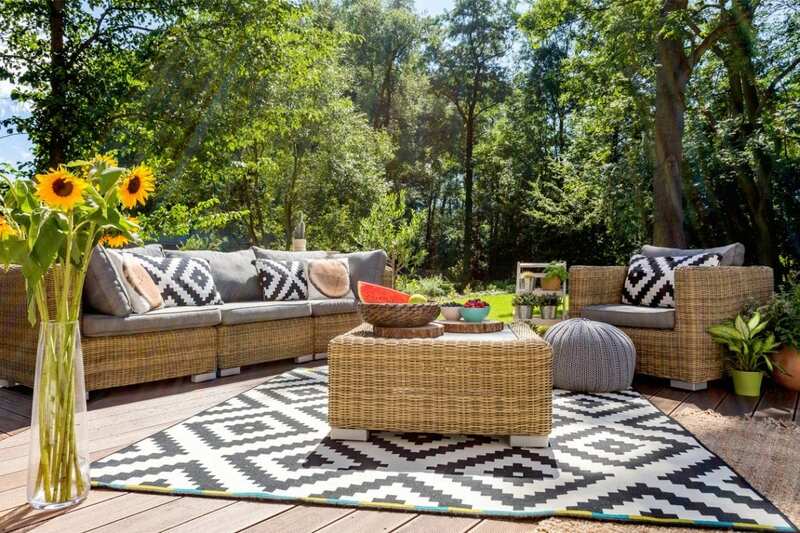 Here’s an Outdoor Furniture Fabric 101 primer on choosing the best material for your deck or patio cushions and pillows. These are typically materials that can withstand the outdoor environment. Other water-resistant materials include oilcloth or vinyl. Perhaps the most durable material in terms of being fade and water-resistant and highly durable is described as “marine use.” These are the materials used to cover seats and benches on boats. While the material is definitely durable, it can be difficult to work with for a DIY sewing or upholstery project. If you’re concerned about sun-fading for your outdoor furniture cushions, take note of the weave of the fabric and the method by which it has color. In general, woven acrylic material is more colorfast than screen-printed acrylic or polyester. Many of these materials are also coated with a water-resistant chemical substance to increase their impermeability. Remember, no matter how water resistant a material is intended to be, prolonged exposure to rain and moisture will eventually lead to saturation. The coating applied to outdoor furniture fabrics affords a moderate level of water resistance. It’s important to remember that repeated washings will erode this protective coating. Also, many of these coatings will break down after prolonged exposure to UV rays from the sun. There are aftermarket waterproofing coatings which can be applied to restore protection, but these are subject to the same deterioration as those applied by the manufacturer. Many of these protective coatings make the fabric resistant to mold and mildew as well. Most outdoor furniture fabric requires very little care to stay functional. However, an occasional cleaning with mild soapy water will keep them clean. Simply wipe them down and allow to air dry. To extend the life of outdoor furniture cushions, store them indoors when they won’t be used for extended periods of time, such as over the winter. While replacing outdoor fabric is sometimes a necessity, it can also be an inexpensive way to update the look of your pillows and cushions. Generally, recovering pillows amounts to a simple sewing project. Upholstering chairs is a bit more challenging, but definitely a great DIY project to make your outdoor furniture look fun, fresh and functional.